At least Doug was honest. I just got my hair cut for the first time in an entire year! Not too unlike you - I was trying to grow my hair out, but they kept cutting it short even when I showed them specific pictures! Now it is long enough there is no way they could mess it up - although crooked I had not considered. Are you thinking of chopping it or just a trim? Mine is way to long. Lazy me! --- It was my first haircut since the summer of 2007. And the chic messed it up in more ways than one. The concept of "no way they could mess it up" doesn't really exist; they can always find a way to mess it up. --- Mine is really long, too. 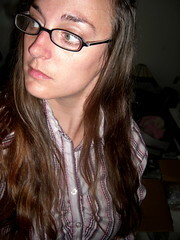 I do like it long, but part of my problem is that I don't like to spend any length of time fixing my hair. I like to let it air dry with its natural waves, though I'll sometimes straighten it. I hate hate HATE having to find someone good to cut my hair. I swear that once I find someone I like s/he leaves the country.